Johnson in action against Connacht in 2016. 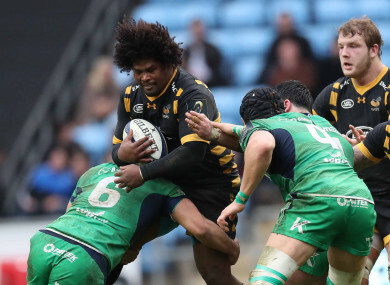 WASPS PLAYER ASHLEY Johnson said he was horrified to discover he had taken a banned substance, after receiving a six-month ban. The 32-year-old Wasps star – capped three times by the Springboks – had the ban backdated to February 7, making him eligible to play again from August 6 2018, as the independent panel deemed he had not acted with intent. “Johnson tested positive for the presence of a specified substance, hydrochlorothiazide (S5 Diuretics and Masking Agents), following an out-of-competition test at the Premiership club,” read the panel’s findings. “The South African’s urine sample returned an Adverse Analytical Finding (AAF) after being tested on 7 February 2018. “The 32-year-old claimed the AAF was the result of mistakenly consuming his wife’s dietary supplement – a fat burner called “The Secret” – which she purchased from South Africa. “The product was tested by both the player and the RFU for hydrochlorothiazide, which was not listed in the product’s ingredients, and on both occasions it returned a positive result. “Ashley Johnson was careless in his failure to acknowledge his responsibilities as a rugby player and ensure he was dutiful in checking what he consumed,” he said. “I was horrified when I got the test results and once we tracked back and worked out I had inadvertently taken the wrong tablet,” said Johnson. Email “Six-month ban for Johnson after consuming wife's fat-burning supplement”. Feedback on “Six-month ban for Johnson after consuming wife's fat-burning supplement”.